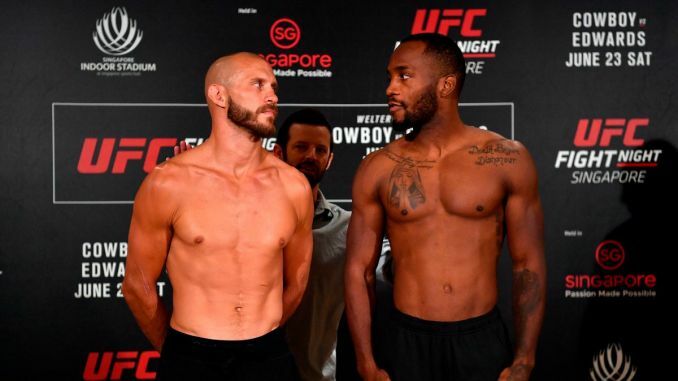 On Saturday morning, the UFC returned to Singapore for a Fight Night event that was low on star power but carried interest through the evening’s main event between welterweights Donald “Cowboy” Cerrone and Leon “Rocky” Edwards. It was the biggest fight of Edwards’ career as he brought a five-fight win streak into the Singapore Indoor Stadium against veteran stalwart Cerrone, who was entering the UFC’s octagon for the 28th since February 2011. It was an important fight for both sides, as the 35-year old Cerrone, despite a victory in January over Yancy Medeiros, is still looking to overcome a tumultuous 2017. In the early rounds, it was Edwards setting the pace with his aggressive striking that proved effective in the first round by cutting Cerrone around his right eye. Edward frequented the body while remaining quick with his counters, which were impressive throughout the fight. It was not until the third round that Cerrone appeared to find a rhythm to Edwards’ style. Cerrone noted the stance switch of “Rocky”, seeing an opening for a brief flurry of punches and landed a big uppercut that appeared to seal the round for “Cowboy”. Edwards rebounded in the fourth round and again displayed his speed and accuracy with the left counter that Cerrone ate numerous times. Edwards immediately got up from a Cerrone takedown, landing an elbow on the break to take the round. In the fifth round, it was a close fight to call but this was Cerrone’s round, who placed pressure for the five minutes and scoring a key takedown and calling on Edwards to meet in the middle before time expired. The judges awarded the fight to Leon Edwards on scores of 48-47 from each. Edwards improved to 16-3 with the win, his sixth consecutive win and issued a challenge to Jorge Masvidal to fight in Edwards’ hometown of Birmingham, England. The co-feature saw 35-year old Ovince Saint Preux turn the tables after a strong start from the younger Tyson Pedro in their light heavyweight bout. Pedro landed a solid right head kick that dazed Saint Preux, who fended off a guillotine choke before eating a pair of elbows from the 26-year old Australian native. The turning point saw Saint Preux counter a takedown attempt to land on top and isolated the right arm of Pedro, using his enormous strength to apply a straight armbar and force Pedro to tap. Saint Preux has quietly won four of his last five fights going back to April 2017 with the lone blemish coming earlier this year when he was stopped by Ilir Latifi. An emotional Jessica Eye earned a unanimous decision victory over Jessica Rose-Clark and her second win since moving down from the bantamweight ranks to the recently added flyweight division. Eye sealed the first and third rounds, with the second the closest of the three and one that could have gone the other way. Eye was on point with her left jab setting up her right hand while Rose-Clark would leave openings that Eye pounced upon. Eye placed an exclamation point on the third round with a takedown and adjusting to side control for the remainder of the fight. Eye was in tears speaking with Dan Hardy after the fight, stating that she was judged unfairly when she was an undersized bantamweight and now at flyweight, she knows she is the best and will prove it. Eye is now 2-0 since moving down to 125 pounds and is quickly erasing the four consecutive losses she suffered while fighting at the larger weight. The main card opened with welterweights, Li Jingliang and Daichi Abe meeting. This fight was maintained and controlled by Jingliang, who was a far superior striker with the numbers adding up with each successive round. Jingliang displayed a strong leg kick game that weakened Abe and left him susceptible for the myriad right hands that came from Jingliang. He concluded the second round with a statement-making flying knee that connected and rang up the strike total in the third round with relentless pressure for the easy unanimous decision victory off scores of 30-26 and 30-27 twice.